April's numbers are up 12.4 percent from the same month last year. 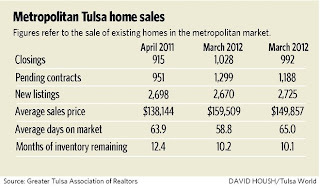 Tulsa-area home sales rose yet again in April, continuing 2012's strong improvement over last year. 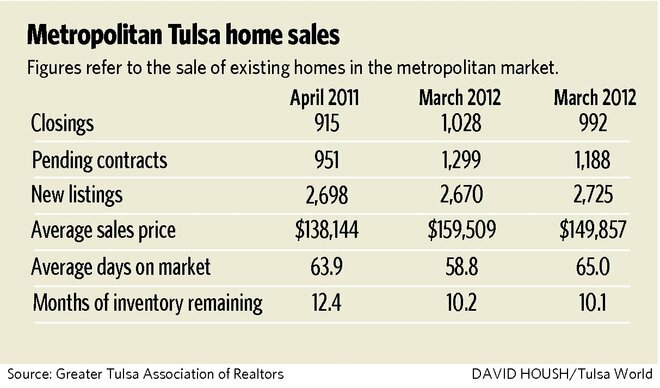 The Greater Tulsa Association of Realtors reports that 1,028 homes were sold in April, up 3.6 percent from March and an increase of 12.4 percent from April 2011. The 3,748 homes that were sold in the first four months of 2012 represent a 20.1 percent increase from the same period last year. Rodger Erker, president of GTAR, said people shopping for homes are getting more enthusiastic. "If buyers are seeing things they like, they're jumping on it," he said. "They're not delaying their decisions. We haven't had that in a long time." Erker said his personal sales at McGraw Realtors are up 62 percent this year. The month was the third-highest April in the past five years, behind the 1,060 homes that sold in April 2008 before the market began to collapse, and the 1,170 in April 2010 during the final days of a federal tax credit for first-time home buyers. Erker said the improvement is due to a combination of low interest rates, a relatively low local unemployment rate, reasonable prices and improved consumer confidence. Pending listings, which indicate purchases that are under contract, rose to 1,299 this April from 951 a year earlier. That was the second-highest month for pending listings in five years, below the 1,479 logged for April 2010. At the same time, the April 2012 inventory declined 7.2 percent to 9,161, giving the month the second-lowest level since 2009. Erker said the drop in inventory and the increase in pending sales are helping to change the face of the market. "We're starting to see homes for sale getting multiple offers," he said. "That's definitely a good sign for sellers." Additionally, the average sale price of $159,509 is 15.5 percent higher than the same point in April 2011, and the median of $125,000 is 4.25 ahead of last year. Erker said the increases stem from sellers gaining strength. At this point, the improvements should continue through the summer, he said. Is it a Gift or Inheritance?